The African Union on Monday launched the much-anticipated Single African Air Transport Market (SAATM) amid strong criticism from member states and some African airlines. The confederation officially launched SAATM at the Assembly of Heads of State and Government of the African Union, held at AU headquarters in Addis Ababa on January 28 and 29. The new chairman of the AU and president of Rwanda Paul Kagame declared the establishment of SAATM at the heads of state summit held on Monday. President Kagame said the launch of SAATM marks a big step forward for the development of the African air transport industry. 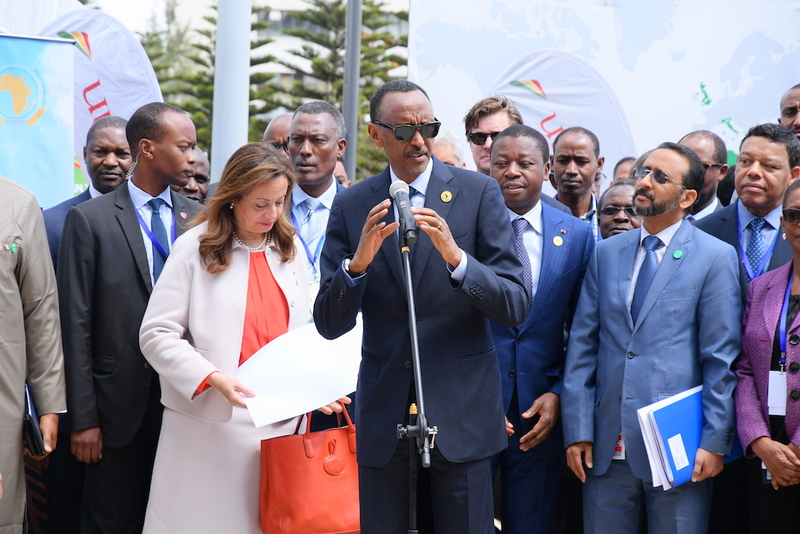 Kagame, AU chairperson Mossa Faki Mohamat, and Togo president Faure Gnassingbé, champion of the single market, cut a ceremonial ribbon at the plaque placed at AU headquarters to commemorate the launch of SAATM. But not all Africans are celebrating the launch of SAATM. Some African countries have put up stiff resistance to its implementation while several African airlines continue to criticize the initiative. Ugandan president Yoweri Musevini expressed fear that SAATM will lead to the supremacy of African skies by a few, already dominant African airlines. “Few airlines are going to dominate and that is not good,” Museveni said. He said he would prefer that African countries form regional airlines first before liberalizing their skies. Nigerian private airline association Airline Operators of Nigeria has also denounced the policy and noted that ministers did not include the group in the discussions leading to the endorsement of its implementation. The Nigerian airlines argued for a “level playing field” where Nigeria can compete with other African carriers, which still enjoy some protectionism, lower interest rates on loans, and waivers on import duty for aircraft and spares. Meanwhile, African aviation authorities reject assertions by modestly sized carriers that the initiative would benefit only big airlines such as South African Airlines, Kenya Airways, and Ethiopian Airlines. Sossina Iyabo, the secretary general of the African Civil Aviation Commission, told AIN that SAATM would benefit every African country and airline regardless of size by improving air connectivity, boosting passenger traffic, and spurring economic development. Nigeria stands as one of the 11 champion states that first expressed its commitment to African open skies in an agreement called the Yamoussoukro Decision, which provides for full liberalization in terms of market access between African states; the free exercise of traffic rights; the elimination of restrictions on ownership; and the full liberalization of frequencies, fares, and capacities. African Airlines Association secretary general Abderahmane Berthe told AIN that the small airlines should cooperate with the big airlines, rather than fight them. “The train of liberalization is there. You cannot stop it,” Abderahmane said, who stressed that SAATM incorporates a regulatory framework and dispute settlement mechanism that protects small airlines from unfair competition. SAATM is one of the goals of the AU’s Agenda 2063, which aims to connect Africa through air transport and other transport infrastructure to achieve economic integration and boost intra-African trade. Of 54 African member states, 23 have subscribed to SAATM and four have begun the process of joining the initiative.